Digital Frontiers Media (DFM) and Miles Media launched an interactive marketing piece for the St. Petersburg & Clearwater Area Convention and Visitors Bureau. Using Augmented Reality technology, the piece, titled “Two Treasures 3D Tour,” features a virtual guide who gives potential tourists an interactive overview of “must-see” destinations. It’s extremely gratifying to have a project like this which leverages our 6 years of experience with Augmented Reality systems to build a commercial application that both engages and enchants. Digital Frontiers Media and Miles Media have completed work on the innovative “Two Treasures 3D Tour,” a marketing piece for the St. Petersburg & Clearwater Convention and Visitors Bureau. 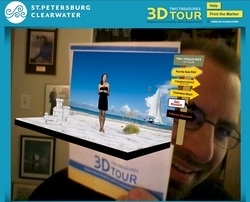 This piece promotes the area by employing 3D Augmented Reality technology to bring tourist sites such as Caladesi Island State Park, Clearwater Beach and The Dali and the Chihuly Museums right to a visitor’s computer screen. The unique approach, conceived by Miles Media and developed by DFM is significantly more engaging than conventional travel brochures. Visitors to visitstpeteclearwater.com/ar print out and hold a specially designed marker in front of their webcam. The marker, a silhouette of a palm tree, instantly transforms into De Soto beach complete with a tour guide and interactive signpost. Digital Frontiers Media (DFM) is a multimedia production company based in Sarasota, Florida that specializes in projects where technology, content and interactivity intersect. DFM develops eye-catching interactive media, national attention-getting websites, and custom programming services, including Augmented Reality (AR) and mobile apps. DFM specializes in the "freakishly brilliant" Drupal open source Content Management System (CMS) and building projects that draw upon multiple disciplines to provide superior user experiences. President Stephen Barker founded DFM in 2007 to provide cost-effective excellence to web and interactive multimedia clients. Stephen was named one of 2010’s “25 People to Watch” in the July issue of Biz941 magazine. Stephen holds a Master's degree for his work in Augmented Reality (AR) and Tangible User Interfaces (TUIs) and has over 5 years of experience in these technologies along with building physical computing systems using sensors, video analysis, servos, and other novel input-output devices. DFM can be found online at digitalfrontiersmedia.com.